For my birthday, will you help build a school? Today (May 20) is my birthday. I don’t need any birthday presents. I have more than enough. I’ve been wracking my brain for a special way to mark my birthday – something that fits with my passions and makes a difference for someone born into less privilege than me. In the past few weeks, we’ve all been horrified with what’s happened in Nigeria to the nearly 300 schoolchildren who’ve been kidnapped by terrorists and have yet to be returned. I would give almost anything to be able to make a difference for those girls and their mothers. I’ve got a strong urge to gather all the fierce and loving women (and men) I know, fly to Nigeria, and form a huge circle of protection around those grieving mothers. And then we’d search until we’d found those girls and we’d form an even bigger circle of protection around them, until the Boko Haram had no choice but to give up. But I can’t. Short of showing up to support the local Nigerian community in an assembly on the steps of our legislative building (which I did), there’s not much I can do. But something else came to me. 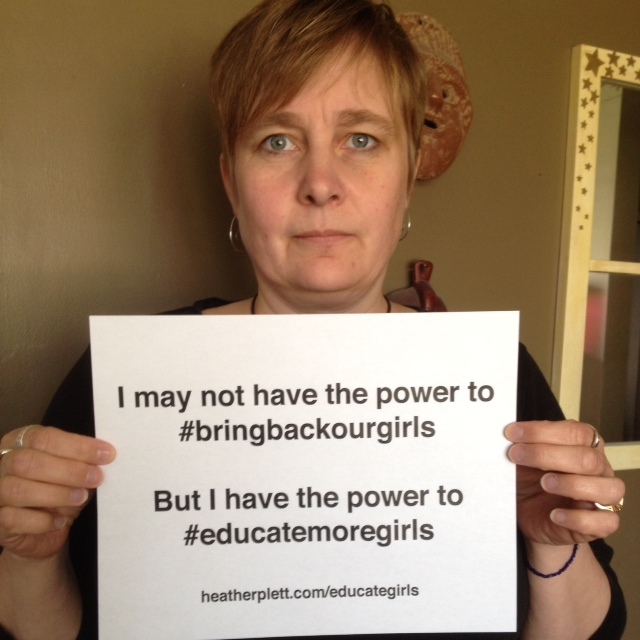 I may not have the power to bring back those girls, but I have the power to educate more girls. That may be the best response to the tragedy in Nigeria. Keep educating girls. Keep telling the terrorists they can’t win. Keep believing that love wins. Here’s what I’m doing… I’m helping my friend Nestar build a school in Uganda – a place that’s known the kind of terror that these young women have gone through. Eight years ago, when I was working in international development, a young woman named Nestar Lakot came to work with my team for a year as an intern. Born and raised in Kitgum District, Northern Uganda during the two decades of civil war between the Lord’s Resistance Army (LRA) and the government of Uganda, Nestar experienced firsthand life in the midst of civil war. Her family was displaced from their ancestral farm-home after losing two of her brothers to the brutality of the LRA. Their home and possessions were reduced to ashes. Nestar is one of the most wise and articulate young women I have ever met – so wise that when she worked with us, we sent her on a speaking tour across Canada. I used to tell her that I thought she might run the UN some day – she’s that smart. 2. When a caller said he thought it was a waste of time to send money to Africa because all of the governments there are corrupt, she didn’t react defensively. She simply said “There’s an old African proverb that says ‘When elephants fight, the grass is crushed. '” She’d seen far too much grass crushed in her young life. Nestar moved to The Netherlands to get her Masters Degree and ended up meeting a man and having two beautiful children. 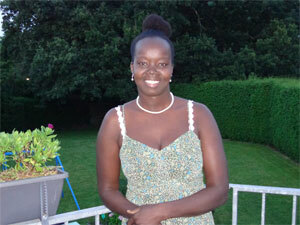 She planned to go back to Uganda, but then her son got sick and needed open heart surgery. It seemed wise to stay in a place where they had access to modern medical care. Because she couldn’t go back right away, Nestar started sending money to Uganda to educate children in the region where she grew up (Kitgum). And then she dared to dream a big dream. What if she started a foundation to build a school for underprivileged children? So she started Uganda Kitgum Education Foundation. She didn’t just wait until she could afford to build a school – she started with what was available. In borrowed space, she started a small preschool with a few children. The next year, the school added grade one, and each year they plan to add a grade level (growing with the children). 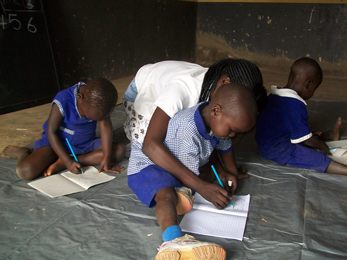 Within a year, the school has grown to educate more than 100 children! Their plan is to build a primary school for 300 students, along with a latrine, underground water tank, solar panel system, dormitories, multipurpose hall, and playground equipment. Read more about their future plans here. Her dream keeps growing and I want to help it grow. Will you help too? Here’s a conversation I had with Nestar recently where she shared more about UKEF and the incredible work they’ve been able to do in just one year. So far, most of it is funded by Nestar’s own efforts – making jam from organic berries, baking cookies, hosting barbecues, etc. As Nestar says, even if it’s small, your donation can go a LONG way in supporting this work. Also, for every registration for Mandala Discovery, I will donate 10% (or $4.50). I’ll be making this a long term commitment, so a percentage of future offerings will also be sent to UKEF. I believe in Nestar and I believe in her work. AND I am happy to support an organization run by someone from the region where the school will be built. Instead of sending in foreign workers who may not understand the local context, we’re supporting someone who knows better than any of us how to help children in her region. Not only does she have first hand knowledge, having grown up in the region, but she has passion and an education – a Masters degree in Public Policy and Human Development. Also, the organization is run by volunteers with low overhead, so 90-95% of your donation will go directly to providing education for children in rural Uganda. If you have any questions, feel free to contact Nestar or me. Here’s a list of others who’ve written related blog posts in support of this campaign. If you write one, let me know and I’ll add your name. I am really grateful to the owner of this web page who has shared this impressive piece of writing at here. Do you have a spam problem on this website; I also am a blogger, and I was wanting to know your situation; many of us have created some nice methods and we are looking to trade strategies with others, be sure to shoot me an email if interested. Thanks on your marvelous posting! I truly enjoyed reading it, you can be a great author. I will make certain to bookmark your blog and definitely will come back later on. I want to encourage you to ultimately continue your great job, have a nice holiday weekend! Every weekend i used to pay a visit this site, because i wish for enjoyment, for the reason that this this web page conations really pleasant funny data too. For hottest information you have to pay a visit the web and on internet I found this site as a finest web site for most recent updates. This post will assist the internet visitors for creating new website or even a weblog from start to end. Very good information. Lucky me I found your site by chance (stumbleupon). I have bookmarked it for later! For hottest information you have to visit web and on world-wide-web I found this web site as a best web site for most recent updates. Very good blog! Do you have any tips and hints for aspiring writers? I’m planning to start my own website soon but I’m a little lost on everything. Would you advise starting with a free platform like WordPress or go for a paid option? There are so many options out there that I’m totally overwhelmed .. Any ideas? Thanks a lot! You’re so interesting! I don’t suppose I’ve read a single thing like this before. So nice to discover another person with original thoughts on this topic. Seriously.. thanks for starting this up. This web site is one thing that is required on the web, someone with a bit of originality! I was very pleased to discover this web site. I wanted to thank you for ones time for this particularly wonderful read!! I definitely really liked every bit of it and I have you book marked to look at new stuff on your site. I have been exploring for a little for any high quality articles or blog posts in this kind of area . Exploring in Yahoo I ultimately stumbled upon this web site. Reading this info So i’m glad to exhibit that I have a very good uncanny feeling I came upon just what I needed. I such a lot undoubtedly will make certain to do not omit this web site and give it a look regularly. Great site. A lot of useful info here. I’m sending it to several pals ans additionally sharing in delicious. And naturally, thanks to your effort! Superb, what a web site it is! This website provides valuable information to us, keep it up. It’s awesome to go to see this site and reading the views of all mates about this article, while I am also eager of getting knowledge. What’s up, everything is going nicely here and ofcourse every one is sharing facts, that’s actually fine, keep up writing. I’ve been exploring for a little bit for any high-quality articles or weblog posts on this kind of house . Exploring in Yahoo I ultimately stumbled upon this web site. Reading this info So i’m satisfied to convey that I’ve an incredibly just right uncanny feeling I discovered just what I needed. I so much definitely will make certain to don?t disregard this web site and provides it a look on a continuing basis. With such cleaners available, it’s possible to take care of cleaning jobs which entail cleaning an important surface area. When the cleaned jewellery is dry, store it in jewelry box which has velvet lining. Whatever you do children’s pool cleaning have to be one of your top priorities. Loving the Pets, Hating their Fleas – Perhaps the reality or the philosophy of ‘the yin along with the yang’ is certainly correct in humans’ day to day lives. If you’re not certain of the solution to buy for your cleaning, consider applying a light detergent for the cloth towel and then use it to wash the stain. These pipes are what make it easy for one to get water whenever you turn about the faucet, washing machine, hose pipes, or what you may have in your home. If an aluminium type surface, either stucco or dimpled, it is best to never apply any polishing agent simply because this can damage the paint put on aluminium surface. When the cleaned jewellery is dry, store it in jewelry box which has velvet lining. These pipes are what make it easy for one to get water when you turn for the faucet, washer, hose pipes, or whatever you have with your home.